When Bundchen, 27, signed a contract in August to represent Pantene hair products for Cincinnati-based Procter & Gamble Co., she demanded payment in euros, according to Veja, Brazil’s biggest weekly magazine. She’ll also get euros for the deal she reached last October with Dolce & Gabbana SpA in Milan to promote the Italian designer’s new fragrance, The One, Veja reported. Bundchen earned $33 million in the year through June, Forbes reported in July. The weakening dollar, which reached record low against euro, actually fueled the demand for the precious metal as investors seek safe heaven to hedge against further decline of the dollar. Meanwhile, news just came out (Bloomberg.com) that China, which holds the world’s largest foreign reserves at $1.4 trillion mainly in dollar based assets such as Treasury bonds, may diversify its reserves to favor “stronger currencies.” If such diversification is indeed implemented, it could further pressure the dollar. As an investor, do you hedge against the falling dollar? between our economic woes, the price of oil, the falling dollar, and china’s probable currency diversification, i’m about ready to start hedging. i’m just not sure where to even begin… i guess i’ll start with your gold coin post! 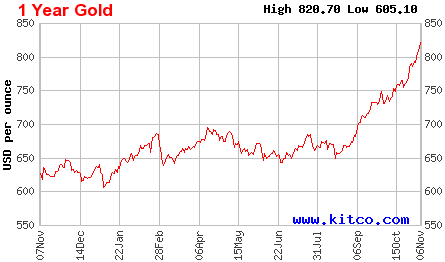 I’m curious, what posessed you to buy gold rather than put it in mutual funds, savings, or another investment? And why did you go with Bullion Direct? I think China will start buying other currencies with new money but they won’t sell their dollars. It’s like an investor who owns a large portion of stocks in one company can’t really just say “sell everything” since he will devalue his own assets if he does that. I don’t consider one coin as an investment, but rather I plan to give them to my children as a gift later. Invest in the metal itself may turn out to be a bad investment in the long term and that’s why I use gold mutual fund, not the metal itself. As for why I used Bullion Direct, I compared it with several other dealers in terms of the price of the coin they are selling, fees and insurance and found Bullion Direct is better than others for small purchases. you should have a look at GPA for Coins for a more realistic prices for your coins. It reports realized values from recent sales.